Adrienne Maloof is one of the stars of the reality television program, Real Housewives of Beverly Hills. These days, Adrienne has a distinctive ”Hollywood” look that makes lots of people wonder if she’s had a few (or a lot!) of plastic surgery. Has Adrienne Had a Nose Job? Photographs of Adrienne in her high school and college days are very hard to find online. However, one photo from this time period does seem to show a young woman with a much larger and more prominent nose. In addition to a very different nose look, young Adrienne had dark hair and a fuller face. While aging definitely changes the way that we look, it typically does not leave us with smaller noses. In fact, noses continue to grow as we get older! 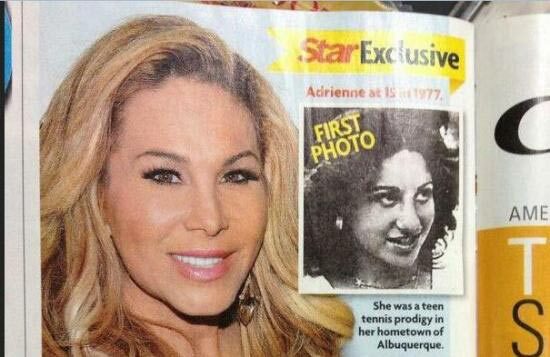 Therefore, before and after photo comparisons seem to indicate that Adrienne may have had a nose job (rhinoplasty) in her adult years. Since she was married to a skilled and renowned plastic surgeon, there is every reason to think that she utilized his talents in order to get the sleek and compact nose look that she wanted. Has Adrienne Had Botox and Fillers? In addition to a possible nose job, Adrienne Maloof displays a complexion that is remarkably smooth and tight for a woman of her age. While she is in excellent shape, which contributes to her defined jawline and facial tightness, she should have some expression lines and wrinkles at this point in life. Since he doesn’t, she may utilize Botox injections and filler injections in order to stay smooth and youthful. While these in-office procedures are a lot different than invasive plastic surgery procedures, such as facelifts and brow lifts, they do change the face, sometimes radically. Most actresses, models and other public personalities do turn to Botox and fillers at some point, usually in order to stave off the visible signs of aging. Since Adrienne does have the money to indulge in these expensive injections regularly, there’s really no reason to assume that she hasn’t gotten these forms of cosmetic procedures. However, there is no way to confirm this, since Adrienne hasn’t talked about it publicly. Now that you know more about Adrienne Maloof plastic surgery, you’ll be ready to make your own decisions about whether or not she has gone under the knife or gotten injections in order to look the way that she does now. Women often feel empowered by plastic surgery, as it gives them the ability to look younger or different. For example, women who’ve always hated their noses may feel confident and liberated from insecurity when they get nose jobs. Plastic surgery is a personal choice, and every woman is different. If it feels right to you, be sure to book a procedure via a board-certified plastic surgeon.